During those months, breast milk is the only alimentation of the baby and the most recommended one. Therefore the amount cannot be measured and it's difficult to say how much milk they are drinking in one day. It's possible that it is drinking for more than 20 minutes and then falls asleep and after 20 minutes asks for milk again. Breast milk can be combined with artificial milk, with baby bottles that mark how much a child is taking during breastfeeding. It's not something really exact because every baby is different and some babies ask for more food than others. If we decide to give only feeding bottles with artificial milk, we should do that every 3 or 4 hours, depending on the weight of the child at its birth. If the baby was born underweight, then it's necessary to feed it every 3 hours and waking it up if it is not asking for it. It's not an exact science, but normally when the baby is little and cries, it is possible that it is hungry. As we said before, it depends on the constitution of the baby. Normally it should receive 74ml of milk for every 450g of body weight a day. You can augment it to 30ml a day per month but you shouldn't give more than 1 liter milk a day. To calculate the ml and the number of spoons with milk powder we should put into the feeding bottle, we can look at the instructions on the bottles of artificial milk and we can always ask a pediatrician for advice. Feeding bottles of plastic as well as feeding bottles of glass are suitable, but each one requieres a different treatment, which we have to keep in mind before choosing a specific one. 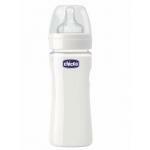 Chicco Baby bottle polypropylene 150ml rubber pink normal flow, light and resistant. How to choose a bath tub for your baby?